Do You Get The Blues? 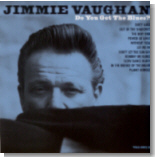 That's the name of Jimmie Vaughan's new CD, and two of our regular Blues Bytes reviewers thought enough of it to submit rave reviews. It's this month's Pick Hit. Our California reviewer dude just cannot understand why Kid Ramos isn't a household name. That's what makes his latest disc for Evidence Records our Surprise feature this month. One of Canada's top blues ensembles, Powder Blues, gets the Flashback of the Month with a 10 year retrospective of their career. This month's What's New section features new releases from Mel Brown, Dr. John, Peter Green Splinter Group, a couple of fine indy releases from NYC by Arthur Neilson and Felix Cabrera, and a tasty gumbo from Nashville's Delicious Blues Stew. Also not to be missed is the trio of great reissues by Arhoolie Records from Lightning Hopkins, Fred McDowell and Chris Thomas King.